Recently taken photos and videos confirm that the Mediterranean monk seal is sensationally making a comeback in Croatia. The scientists still don’t know the exact number of individuals, but the “Mediterranean Monk Seal Group” has collected over 4,500 photos and video clips proving that the Adriatic is again a permanent habitat for these critically endangered mammals. Mission: Monk Seal .Desertas Islands – Deserta Grande – Madeira, Portugal. August 2009. Monk Seal (Monachus monachus) male identified by Parque Natural da Madeira as “metade”. Most of the Mediterranean monk seals have been spotted in two groups – one near the Kamenjak Cape and another on the west bank of Cres Island. These rare sea mammals have begun to appear more often over the last year. In September 2012, Mediterranean monk seals were reportedy seen splashing the water near the beach of Centinera u Banjolama. Enthusiastic spectators enjoyed the chance to meet them this year near the Kamenjak cape and in several other places along the Adriatic coast. “Based on the data gathered it is estimated that the Adriatic now harbours between 4-5 Mediterranean monk seals”, says Emanuele Coppola, President of the Mediterranean Monk Seal Group for the Croatian daily newspaper “Danas”. This is great news also for the Velebit rewilding area, which is planned to extend out into the Adriatic archipelago. The Mediterranean monk seal belongs to the suborder Pinnipedia, the seal family (Phocidae) and the genus monk seals (Monachus). In Croatia, this seal is also known as the ”Sea man”, the ”Sea bear” or the ”Sea monk”. It was first scientifically described in 1779, based on a carcass found at Osor on the Island of Cres. The male Mediterranean monk seal can grow to a length of 2.5 m and weigh up to 400 kg. Males are usually blackish grey with white spots on the belly. Females are somewhat smaller than males and are usually greyish in colour. They live in small, isolated groups of 5 to 7 individuals in island areas.. The life span of the Mediterranean monk seal is more than thirty years, but a lot about its biology still remains unknown. 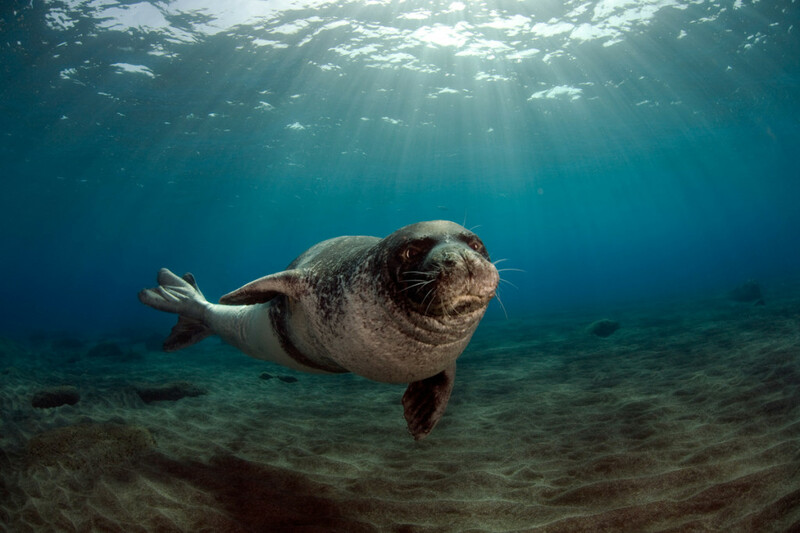 The Mediterranean monk seal is one of the world’s most endangered mammals. According to the IUCN Red List this species is facing extinction, with a status of critically endangered (CR). It was once widely distributed throughout the Mediterranean Sea, Black Sea and northern Atlantic along the western coast of Africa. It lived in colonies, using spacious beaches. However, intensive hunting over the centuries has drastically reduced its populations. Over time, it was forced to avoid its original habitats due to the intensive development of coastal areas. It is thought that it has changed its way of life and habitat in order to adapt to the new situation. Today, it uses sea caves that are not affected by human disturbance, usually with submerged marine entrances and comfortable gravel beaches or sand slabs within the caves for sleeping and for nursing the young. The once wide distribution range of this species has been completely fragmented and today only two larger populations remain, which have developed significant genetic differences. The largest population is along the western coast of Africa (Cabo Blanco), where the monk seals continue to live in larger colonies on the sea beaches, whilst the second colony is found along the coasts of Greece and Turkey. There is also a colony at the Portuguese Desertas Islands, near Madeira. The Mediterranean monk seal is protected under the Croatian Nature Protection Act and is included in Annexes II and IV of the Habitats Directive, Annex II of the Bern Convention, Annexes I and II of the Bonn Convention, Annex I of the CITES Convention and Annex II of the SPA protocol of the Barcelona Convention. Killing of a Mediterranean monk seal is punishable with a fine of 100.000 Croatian kuna (around 13,500 euro). According to the IUCN data, the Mediterranean monk seal is considered to be possibly extinct in Croatian waters, while according to the Red Book of Mammals of Croatia from 2006, it has the status of a regionally extinct (RE) species, considering that the last sighting of a young pup was in the early 1990s (Mljet 1992, Palagruža 1993). It is believed to have been present throughout the Adriatic Sea just 100 years ago, though it was likely never a very large population, only 30-40 adults at most. Over the past 15 years, there have been several reports of sightings of adult Mediterranean monk seals in the Croatian waters of the Adriatic. In the recent years, the intensity of sightings has increased substantially, with more reports now documented by photographs and films. Sightings are regular in different parts of the Adriatic, especially along the eastern coast of Istria and the western coast of the islands of Cres and Lošinj according to information from the State Institute for Nature Protection of Croatia. You can download the Wildlife Comeback study commissioned by Rewilding Europe and released in 2013 as a pdf here.